Biking Across Kansas, the annual week-long supported tour across the Sunflower State, has announced their 2015 route, which crosses the central tier of the state, June 6-13, 2015. 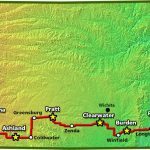 Biking Across Kansas, the annual week-long supported tour across the Sunflower State, has announced their 2014 route, which angles across the state from the southwest to the northeast, from Elkhart to White Cloud, for a total of about 547 miles, June 7-14, 2014. This is an account of my participation in the 2008 edition of the Biking Across Kansas tour, which traversed the northern part of the state, from Colorado to the Missouri River. This is an account of my participation in the 2006 edition of the Biking Across Kansas tour, which traversed the southern part of the state, from Colorado to Missouri. Salina bicyclist fatality, Peddling Safety on Pedals, Wichita River Festival Encourages Bicycling, Topeka Bicyclist Injured By Inattentive Driver, Louisburg To Review Bicycling Ordinances, and more bicycling news from Kansas and other states in the region. Biking Across Kansas, the annual week-long supported tour across the Sunflower State, has announced their 2013 route across the southern tier of the state, from Johnson City in the west to Galena in the east, for a total of about 507 miles, June 8-15, 2013. Biking Across Kansas, the annual week-long supported tour across the Sunflower State, has announced their 2012 route, which runs from Sharon Springs in the west to Elwood in the east, for a total of about 475 miles, June 9-16, 2012. Biking Across Kansas, the annual week-long supported tour across the Sunflower State, has announced their 2011 route, which runs from Tribune in the west to La Cygne in the east, for a total of about 474 miles, June 4-11, 2011.